Even the Pope is not immune from Trump's criticism on Twitter. camera (Frederick M. Brown/Getty Images | Filippo Monteforte/Getty Images) Donald Trump speaks onstage during the 'The Celebrity Apprentice' panel discussion at the NBC/Universal portion of the 2015 Winter TCA Tour at the Langham Hotel on Jan. 16, 2015 in Pasadena, Calif. and Pope Francis arrives in St Peter's square at the Vatican on Sept. 9, 2015, for his weekly general audience in Rome. All eyes are on the pope in the United States today. 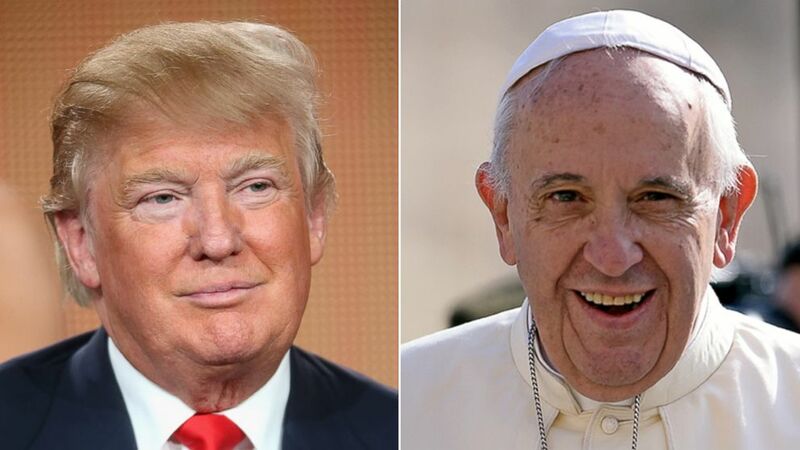 While the Holy Father is meeting with President Obama at the White House, presidential hopefuls for the job are sharing their thoughts on the pontiff and his positions on climate change, immigration and social issues. Just a few days later, Trump, who is a Presbyterian, was on the attack. He criticized the new pope for paying his own hotel bill. Overall, the real estate mogul says he’s a fan. Why? He also did not approve of Pope Benedict’s decision to give up the Papacy, the first pontiff to do so since 1415. And he criticized Obama over his handling of the Affordable Care Act.